April 2019, AMMAN / JORDAN – Generations For Peace has announced a new three-year partnership with the Olympic Refuge Foundation in an effort to improve overall status of the vulnerable female and male Syrian refugee and Jordanian youth from host communities in Amman, Irbid, Mafraq, and Zarqa. Working within the frameworks of the existing Generations For Peace Nashatati (“My Activities”) and Maharati (“My Skills”) Programmes, this new programme will increase equal access to sport-based activities for refugee and Jordanian youth in 108 schools and 76 youth centres across the four Jordanian governorates with the highest number of Syrian refugees. 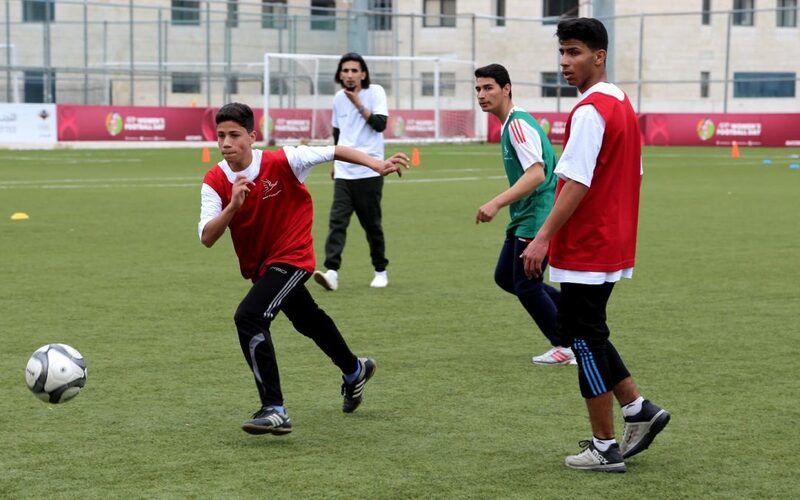 The partnership includes a grant, which will help Generations For Peace to sustainably engage at-risk female and male refugee and Jordanian youth through a series of weekly GFP Clubs activities, a Summer Camp designed to expose youth to a wide range of new sports during the summer breaks, and the integration of a “Sport For Protection” component developed by the International Olympic Committee (IOC), the office of the United Nations High Commissioner for Refugees (UNHCR), and Terre des Hommes. Furthermore, in each aspect of the programme, specific efforts will be taken to maximise inclusion of hard-to-reach youth, including those with disabilities. The number of anticipated direct beneficiaries will near 12,000, including 216 teachers and 156 youth centre workers trained and mentored by Generations For Peace, in addition to 11,600 children and youth directly participating in activities. An additional 41,600 children and youth are expected to be indirectly impacted beneficiaries of this programme.